This study deals with the inactivation of browning enzymes in potato by using various chemical agents. Potato purchased from a supermarket was treated by ascorbic acid and calcium chloride solutions alone and in combination. The effects of different chemical treatments on the surface appearance and selected quality indexes of potato slices during 2-weeks of storage at refrigeration conditions (0-4°C) were evaluated. Potato slices were immersed directly to the distilled water at room temperature for the Control samples to evaluate the browning process. The combined chemical treatments showed less browning in the potato slices compared to the applied solutions alone. Beside the inactivation of the enzyme, the combined treatment also showed a better success to prevent color degradation of potatoes. This study showed that the combining chemicals rather than using them alone is important in terms of processing of cut potato slices with a less browning and acceptable colors. Agar, I.T., Massantini, R., Hess-Pierce, B., Kader, A.A. (1999). Postharvest CO2 and ethylene production and quality maintenance of fresh-cut kiwifruit slices. 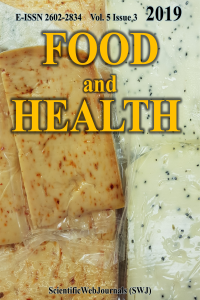 Journal of Food Science, 64, 433–440. Ahveainen, R. (2000). Minimal processing of fresh produce. In: Alzamora, S.M., Lopez-Malo, A., Tapia, M.S. (eds). Minimally Processed Fruits and Vegetables, Aspen Publisher Inc., Gaithersburg Maryland, USA, pp: 277-290. Altekruse, S.F., Cohen, M.L., Swerdlow, D.L. (1997). Emerging foodborne diseases. Emerging Infectious Diseases, 3, 285-293. Annese, M., Manzano, M., Nicoli, M.C. (1997). Quality of minimally processed apple slices using different modified atmosphere conditions. Journal of Food Quality, 20, 359-370. Cemeroglu, B. (2007). Gıda analizleri. Gıda Teknolojisi Dernegi Yayınları, No: 34, Bizim Büro Basımevi. Ankara, 535 s.
Dorantes-Alvarez, L., Chiralt, A. (2000). Color of minimally processes fruits nd vegetables as affected by some chemical and biochemical changes. In: Alzamora, S.M., Lopez-Malo, A., Tapia, M.S. (eds). Minimally Processed Fruits and Vegetables, Aspen Publisher Inc., Gaithersburg Maryland, USA, pp:111-126. Dziezak, J.D. (1986). Preservatives: antioxidants–the ultimate answer to oxidation. Food Technology, 40(9), 94-102. Golan-Goldhirsh, A., Whitaker, J.R., Kahn, V. (1984). Relation between structure of polyphenol oxidase and prevention of browning. Advances in Experimental Medicine and Biology, 177, 437-456. Heaton, J.W., Marangoni, A.G. (1996). Chlorophyll degradation in processed foods and senescent plant tissues. Trends in Food Science and Technology, 7, 8–15. Lee, J.C., Eun, J.B. (1999). Inhibition of enzymatic brown-ing in precut lotus (Nelumbo Nucifera) roots by brown-ing inhibitors and vacuum-packaging. ISHS Acta Horticulture, 483, 349-356. Lund, B.M., Snowdon, A.L. (2000). Fresh and processed fruits, in The Microbiological Safety and Quality of Food, B.M. Lund, A. Baird-Parker, and G. W. Gould, Eds., pp. 738-758, Aspen, Maryland, MD, USA. Martinez, M.V., Whitaker, J.R. (1995). The biochemistry and control of enzymatic browning. Trends in Food Science and Technology, 6, 195–200. Montgomery, M.W., Sgarbieri, V.C. (1975). Isoenzymes of banana polyphenol oxidase. Phytochemistry, 14, 1245. Pérez-Gago, M.B., Serra, M., Alonso, M., Mateos, M., del Río, M.A. (2005). Effect of whey protein and hydroxypropyl methylcellulosebased edible composite coatings on color change of freshcut apples. Postharvest Biology and Technology, 36, 77-85. Saltveit, M.E. (1997). Physical and physiological changes in minimally processed fruits and vegetables. In: Phytochemistry of Fruits and Vegetables, pp. 205–220. Tom´as-Barberan, F. A., and Robins, R. J., Eds., Phytochemistry Society Europa, Clarendon, Oxford. Sapers, G.M., Ziolkowski, M.A. (1987). Comparison of erythorbic acid and ascorbic acids as inhibitors of enzymatic browning in apples. Journal Food Science, 52(6), 1732-1733. Sapers, G.M., Garzarella, L. Pilizota, V. (1990). Application of browning inhibitors to cut apple and potato by vacuum and pressure infiltration. Journal of Food Science, 55, 1049-1053. Sgroppo, S.C., Vergara, L.E., Tenev, M.D. (2010). Effects of sodium metabisulphite and citric acid on the shelf life of fresh cut sweet potatoes. Spanish Journal of Agricultural Research, 8, 686–693. Tortoe, C., Orchard, J., Beezer, A. (2007). Prevention of enzymatic browning of aple cylinders using different solutions. International Journal of Food Science, 42(12), 1475-1481. Whitaker, J.R., Lee, C.Y. (1995). Recent advances in chemistry of enzymatic browning. An overview. In: Lee, C.Y., Whitaker, J.R., editors. Enzymatic browning and its prevention. Washington, DC: American chemical society. p 2-7. Yildiz, G., Rababah, T., Feng, H. (2016). Ultrasound-assisted cutting of cheddar, mozzarella and swiss cheeses - effects on quality attributes during storage. Innovative Food Science & Emerging Technologies, 37, 1-9. Yildiz, G. (2018). The effect of different chemical agents on the prevention of enzymatic browning in banana. Journal of Food Science and Engineering, 7, 86-91.